Normally I am quite happy to buy my peanut butter from the supermarket and it never crossed my mind to make my own. But way back in July our supermarket decided to replace our favourite brand with one made in Australia and they pushed the price up as well. That was it. I refuse to be dictated to, and be told what I can or cannot buy, or where from. I decided to make my own ! It was actually ridiculously easy provided you have a gadget similar to the famous Magic Bullet and you can have fresh peanut butter jelly sandwich in less than 3 minutes. The proof is in the video. The texture was in fact much creamier and not as dry as the bought ones. And you can actually smell and taste the peanut. 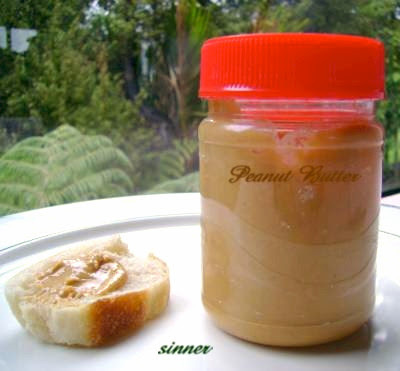 Once you have tried some homemade peanut butter, you won't want to go back to that tasteless storebought 'paste'. Plus you know exactly what ingredients has been used. 1. Place all the peanuts into cup of the bullet. Use the flat blade and process until the nuts are roughly broken up. 2. Add oil and salt. Change to the cross blade. Continue to pulse (shaking and scraping the sides of the container every now and then). As you process you will notice the mixture will become more liquid and oily. Process until you are happy with the texture. 3. Scoop the peanut butter into an airtight container. It may be stored in the refrigerator for up to 2 months. This is a 3 minute video of the whole process of making creamy peanut butter. Not my usual fast and sped up videos. I had to prove through this 'uncut' version that it can be done in less than 3 minutes. I prefer to make this small quantity which last me a week. The peanut butter stays fresh, moist and fragrant. 1. To get a darker coloured peanut butter, roast the peanuts until it is darker. I find the overly roasted peanuts makes a much more aromatic peanut butter. 2. I prefer to use onion oil as I always have some in my pantry and it also makes the peanut butter more fragrant. 3. Leave the peanut butter to sit for a few minutes and you will notice a glisten of oil on top. I make my own peanut butter too - just plain. I will try it with shallot oil. Sounds delicious! p/s: Still didn't get around to making the taufu far! It's on my to-do list!!! sinner you are so clever!! i'm gonna try this soon thanks! karlsfoodie, do try it. It really is easy. tricia, looks like I am a bit slow on jumping on this bandwagon. I bet you have a long to-do-list. jean, you are too kind. Would love to hear how you get on. Snap, we are making our own peanut butter too, ever since most of it started getting made in China and it is too sweet and dropped the percentage of peanuts- but I am so pleased to be making my own cos it just tastes better!!! Spread the word!!!! Thks for sharing Sinner :-). The peanut butter looks so good! Can I use the big blender for this? TIA! Linda F, I found out recently that the manufactured peanut butter have transfat in it. All the more reason to make ones own. Littlehands,you should be able to do this with a big blender but you will need to do a bigger quantity. Big blenders can be a bit of a pain though as the food just gets spun to the side . The washing part too could be a chore as you would have more stuff to wash. As with anything if it becomes tedious you won't make that item regularly. But do give it a go, your big blender might be a more powerful one than mine. favbabe, thank you, there are lots of things I can't make ! lol. Before you make the peanut butter, better to make sure the store ones is nearly finished. Ours is sitting in the fridge and is used as mouse bait as no one wants to touch those now !! Hope you try this soon. The homemade texture is so much better than that of the bought ones. Tried making the peanut butter today and it turned out really yummy!!!! Much better tasting than the store bought ones.Couldn't stop my son "stealing" from the jar. I added roughly chopped peanuts to add texture to it as hubby likes it with some bite...thank you so much for sharing the recipe, you have helped us save $$$. I chanced upon your website and am getting very excited....do you have a recipe for peanut pancake, the chinese hawker style??? Please....??? Nelly, welcome. Is it the one with a peanut sugar filling ? No recipe at the moment but on my to-try list. Anyone know the nutritional value of this compared to the shop bought stuff which i presume has lots of nasty preservatives etc. Sophie, the 'nasties' to watch out for in commercial peanut butter would be what type of fat they add. Where can I get bulk peanuts (plain or roasted?) or do you just buy the little bags in the store? Just need a little more guidance. The biggest packet I can buy in Auckland is 1kg. Not advisable to buy too much as nuts can get rancid quite quickly. It is also cheaper to buy them raw and to roast them yourself. I would like to know if i could sub peanut oil with oilve oil. Because that is the only oil I have at home. Please advise. You can use it but bear in mind that olive oil has a strong aroma. A more neutral oil like canola would be better. Thank you for sharing. I tried another recipe but the texture was too dry. I used a larger food processor. Your recipe sounds quicker and the texture seems to be more moist. What is the smaller food processor that you are using? What is the capacity? Are you using Virginia Peanuts? I used the Amazing Bullet which is the equivalent of Magic Bullet. They have 2 cup sizes. For the peanut butter, I prefer grinding with the 1 cup capacity. Here in NZ, we have no choice for types of peanuts. I just buy whatever is available off the shelve. However, lately I have found that peanut butter made from their skinless blanch nuts tasted even better. I had a big container of "mixed nuts" and had pretty much picked through them till only the peanuts remained....put a cup in my magic bullet...added a little oil and a single packet of splenda to the mix (grinded the nuts with flat blade first) and it turned out fantastic...I was all set for a PB&J but wouldn't you know the grape jelly was looking a tad old so had to put a replacement on the grocery list and settle for a peanut butter sandwiche. Was delicious...I even left the thin hulls on the peanuts so the peanut butter has a little fiber in it. There may have been a few non peanuts left (cashews, macadamia etc) but they just added flavor. Thanks for the info! My friend who is a peanut butter lover made this and it was good. Thanks for the recipe. Famewolf - ain't fresh peanut butter the best. THanks for the excellent video on making peanut butter. I've been making nut butter for a while. Instead of the magic bullet, a regular food processor works very well - and you don't need to manually shake the contents all about :-). It works very well for roasted almonds and roasted hazelnuts too. Good to know you can use a blender to make peanut butter. Can you share the brand of your blender? How many gms of peanuts do you blend each time ? I'm thinking of buying an Amazing Bullet. Does it actually grind small seeds like sesame and crush ice? Because if it actually works i'm going to buy it, is it worth it? Has yours broken yet? If so, how long did it last? I am still using my original Amazing Bullet. Not broken yet ! The only thing I have replaced is the blade component. I can't actually remember when I bought it, but going by this peanut butter postdate, I guess it is more than 3 years old and for a gadget that is used practically everyday it still going strong. Frankly for something so cheap, I did not expect it to last that long! Yes, it does grind small seeds like sesame but I have not tried grinding or crushing ice. I personally will not use or even attempt to crush ice unless I am ready to replace my Amazing Bullet with a new one - then I will try !